Our family moved from Scotland to Virginia when I was seven years old. My father is an avid golfer so one day shortly after our arrival we went to the driving range. While he was busy hitting golf balls, I was busy exploring the area like any normal 7-year-old. At one point, I ventured into a patch of long grass. It was a little scary since the grass was almost as tall as I was and there were prickly weeds around that I was carefully trying to avoid. situation made me start crying at the top of my lungs. My parents rushed over to see what the problem was. They extracted me from the long grass and discovered that I had been stung by a bee! This was the first bee sting I ever received. They tried to calm me down and explain that everything was going to be OK. But I was completely inconsolable and continued to bawl at the top of my lungs. Needless to say, a desperately crying child is not the most conducive thing to hitting golf balls. While this was going on, I happened to be watching one man on the range. He took a swing and, after hitting the ball, his club “accidentally” slipped out of his hand and flew about 50 yards down the range. I thought this was about the funniest thing I had ever seen and immediately started to laugh. Having your club fly out of your hands is about as embarrassing a thing as could happen to someone at a driving range. The man turned around and apologetically asked everyone if they would please stop hitting balls so he could go out and retrieve his club. It took a couple of minutes to get everyone to stop. He handled the situation with humor, humility, and grace. After everyone had stopped, he ran out onto the range, retrieved the errant club and ran back holding it over his head. I watched the whole thing in great amusement. After everyone had started to hit balls again, I had forgotten about the bee sting and had stopped crying. I didn’t realize it at the time, but it seems obvious now that he had let his club go deliberately, to try to get me to stop crying. I am also quite sure that everyone on that range was happy that he had done so. 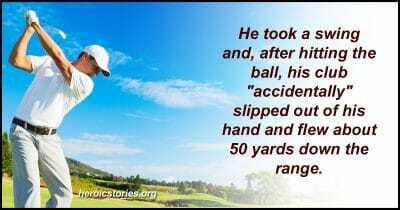 I have since learned to play golf and have been to driving ranges many times. I now understand the courage it took for that man to throw his club into the range. His gracious way of handling the situation spared others from potentially doing something ungracious to calm me down. He risked making a fool of himself but chose to act anyway. Golf a game as much against your self as it is against others. Play long enough an you will realize that overcoming your previous issues and not letting them get to you is half the battle. It is called the gentleman’s sport, and you witnessed a true gentleman that day!